The mission of the Soyuz TMA-4 spacecraft to the International Space Station in the spring of 2004, was originally intended to be a routine exchange of a rescue vehicle onboard the outpost. The so-called "taxi crew," would fly Soyuz TMA-4 to the station, spend a week onboard and then parachute back to Earth inside the reentry capsule of the previous Soyuz TMA-3 spacecraft. However, the Columbia accident in February 2003 and resulting grounding of the Shuttle fleet left Russia as main "care taker" of the station and the Soyuz spacecraft as the only vehicle capable of rotating crews onboard the outpost. The Soyuz TMA-4 mission was assigned to deliver the 9th long-duration crew to the ISS. It would be the fourth Russian vehicle used for such purpose in the ISS program and the third since the loss of the Shuttle. The original crew of Expedition 9 to the ISS was officially annnounced on March 19, 2002, about a year and half before the planned launch. It included Russian commander Gennady Padalka, who led the 26th crew of the Mir space station; and two flight engineers: NASA astronaut Michael Fincke and Russian cosmonaut Oleg Kononenko. With the Shuttle offline and only limited flow of supplies to the station, permanent crews onboard the outpost were reduced from three to two. 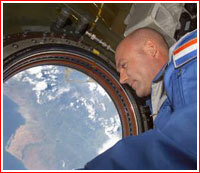 As a result, Kononenko was bumped from the Expedition 9 crew. Instead, the European researcher joined ride onboard Soyuz TMA-4 for a week-long mission onbord the ISS. At the end of June 2003, ESA and Rosaviacosmos reached a preliminary agreement on the flight of European researcher Andre Koupers to the ISS. 2004 April 7: The main and backup crews visited Baikonur to conduct familiarization training with the Soyuz TMA-4 spacecraft. 2004 April 8: The assembly of two booster stages of the Soyuz FG launch vehicle for the mission was completed at Site 112 around April 8, 2004. 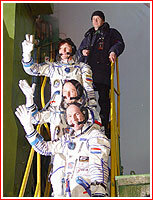 2004 April 14: The main and backup crew arrived to Baikonur for final preparations for the flight. A new shift of residents of the International Space Station, ISS, departed Earth onboard a Russian rocket. The Soyuz TMA-4 (No. 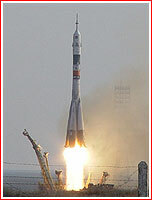 214) spacecraft, carrying a crew of three blasted off from Baikonur Cosmodrome's Site 1, at 07:19 Moscow Time on April 19, 2004. Onboard were Russian commander Gennady Padalka, who led the 26th crew of the Mir space station, NASA astronaut Michael Fincke and Dutch astronaut André Kuipers, representing the European Space Agency, ESA. Padalka and Fincke comprise Expedition 9 of the station and were expected to replace the previous long-term crew, which has been living onboard the outpost since October 2003. Kuipers was scheduled to return to Earth with Expedition 8, after around nine days onboard the station. According to mission control in Korolev, the Soyuz TMA-4 was scheduled to separate from the upper stage of the launch vehicle at 07:27:45.26 Moscow Time in the 200 by 242-kilometer orbit. After five orbit manuevers, the Soyuz TMA-4 successfully docked to the nadir (Earth-facing) port of the Zarya FGB control module of the ISS at 09:01 Moscow Time (0501 GMT) on April 21, 2004. The crew entered the station around 0600 GMT the same day. After transferring control over the station to the fresh crew, the Expedition 9 members Gennady Padalka and Michael Fincke, along with Yuri Shargin boarded Soyuz TMA-4 spacecraft and undocked from the ISS at 01:08 Moscow Time on Oct. 24, 2004. The successful landing of the reentry capsule took place at 04:36 Moscow Time (0036 GMT) the same day or around four minutes later then projected time near Kazakh town of Arkalyk. Despite night conditions, rescue helicopters easily detected the reentry vehicle, while it was still in the air and then followed it to the landing site, reaching the capsule 14 minutes after the touchdown.